German anarchist communists influenced by the ideas of Johann Most or by the Autonomie Group around Peukert gravitated at first to Der Sozialist set up by Gustav Landauer in 1891. However, they soon found Landauer’s approach too intellectualised and his role in the paper too dominant. They were critical of his attitude to cooperatives which they regarded as reformist and they thought that whilst Landauer had broken with social-democracy he had not sufficiently made a break with Marxism. These arbeiteranarchisten (worker anarchists) as they were called split with Landauer in 1897. As a result, they abandoned that paper and regrouped around Neues Leben (New Life). Neues Leben was edited by the metalworker Paul Pawlowitsch (born 1864 in Berlin). Pawlowitsch was described by Rudolf Rocker as “at best an acceptable propagandist” and “unscrupulous and authoritarian”. Pioneering efforts to create a new organisation were first initiated by Wilhelm Hugo Klink, (1) a brush maker living in Bietigheim, 10 km from Ludwigsburg. He pushed the idea in 1899 of organising coordination of anarchists throughout Germany in conjunction with other parties and trade unions. A year later, he realised that he should focus solely on the setting up of a specific anarchist organisation. He wrote: “To action! Out there, out to the public and so involved that we come closer to our ideal. First, misconceived individualism must be dropped and the comrades must organize themselves and shape the organization so that it does not run counter to our views. The task of this free association must be to provide for agitation, education and education among the comrades and to bring them to a higher spiritual culture. Economic combat organizations must be created and organized locally; with it rigid union centralism, which is a drag on the movement, must be broken”(1899). Wilhelm Klink suggested the setting up of four federations to cover the whole of the German Empire, covering southern Germany, Rhineland-Westphalia, Silesia and northern Germany (including Berlin). However, anarchists in Berlin rejected the need for organisation so Klink devoted himself to setting up a south German federation. At an anarchist meeting in Württemberg in summer 1900, comprising ten anarchists from four cities, the Süddeutsche Föderation (South German Federation) was founded. In addition, an agitation committee was set up in Bietigheim to work towards the development of a movement of free unions and cooperatives. By the end of 1900 group from ten cities had joined the Süddeutsche Föderation. In addition, a free trade union association was set up on which Klink served as chair for a time. The Federation kept up its connections with anarchists in Berlin and Silesia. It formalised a process of setting up local groups and connecting them through contact persons to the Federation as well as supra-regional structures. This growth resulted in the first conference of the German Federation of Revolutionary Workers (Deutschen Föderation Revolutionärer Arbeiter-DFRA) on 7-8th April 1901 in Bietigheim and Gablenberg. This was attended by 21 delegates from Bietigheim, Stuttgart, Heilbronn, Mainz, Wiesbaden, Cologne, Munich, Görlitz, Rixdorf, Berlin, Leipzig, Halle, and Hirschberg in Silesia. Sympathy subscriptions came from Mannheim, Dusseldorf, Solingen, Reutlingen, Graz and Basel. There was fierce argument about where the DFRA should be centred, whether Bietigheim or Berlin. Pawlowitsch in particular was adept at creating enemies and the DFRA split into two different federations the following year. There was rivalry over which was to be the organ of the DFRA, Neues Leben or Freiheit, (edited at first in Bietigheim by Klink, then subsequently by him in Stuttgart and then Amsterdam). Pawlowitsch continued to snipe at Freiheit saying “Freiheit as an organ of the Federation has not done what they should do. Instead of explaining the basic ideas of federalism systematically and explaining the federalist form of organisation historically and theoretically they propagate rather polemical articles in the columns of Freiheit and often in the ugliest forms”. Parallel to the development of specific anarchist organisations was the founding of an umbrella organisation of “localist” unions opposed to the increasingly centralised trade unions at a conference in Halle in May 1897 which in 1901 took on the name Freie Vereinigung deutscher Gewerkschaften (Free Association of German Unions FVdG). At first this grouping saw itself as being on the left of social-democracy but turned rapidly in the direction of revolutionary syndicalism. Thus, there were discussions in anarchist circles whether they should work within anarchist unions or within syndicalist unions, as for example at a meeting in Ludwigsburg in 1909 which produced a statement noting that “Syndicalism must not weaken anarchism, as is unfortunately to be noticed in some cities”. In March 1901 Pawlowitsch founded the Verein Freiheitlicher Sozialisten Berlins und Umgegend (Association of Libertarian Socialists of Berlin and the surrounding area VFSB)” along with Rudolf Lange (2) and Albert Dräger, a mechanic and metalworker born in 1868. Lange, who from time to time had edited Neues Leben, now founded Der Anarchist. Lange had at first been under the influence of Landauer but disagreed with his orientation, whilst continuing to recognise his qualities as a human being and as a thinker. Lange began looking to create a movement oriented to the working class. He had become unhappy with the possibility of Neues Leben being able to accomplish this task. Rocker wrote that putting that paper in the hands of Pawlowitsch was a “colossal mistake” and that “many comrades in Germany understood it immediately” and tried after Lange returned from abroad to entrust him with its direction. Pawlowitsch resisted this and he and his supporters tried to remove Lange from the movement in 1902, using “the most dishonest and meanest means” (Rocker) to achieve this. Lange was denounced in the pages of Neues Leben as an individual harmful to the movement, and then accused of financial irregularities during Lange’s agitation tours of Germany. Another collaborator with Neues Leben, Richard Klose, was also included in these accusations. Lange and Klose responded to these accusations with a hectographed circular which was reprinted in the pages of Klink’s Freiheit. Lange had some influence in the Elberfeld anarchist federation and one of its leading militants Ernst Schwab suggested that Lange edit a new newspaper to replace Freiheit after Klink was charged with crimes against morality, the sexual abuse of a twelve-year-old girl and then fled to Amsterdam. The paper was first scheduled to be printed in Dusseldorf according to a circular put out in mid-February 1903, but there were difficulties about obtaining a printer and finally in March 1903 Der Anarchist appeared initially edited by Richard Klose. Rocker described it as “certainly one of the best German sheets”. Its sub-heading read: “Anarchy is order, freedom and prosperity for all”. After a raid Klose moved abroad in July 1903 and Lange edited the paper which ran until 1907. Meanwhile Klink had issued a statement saying that police had framed him and that really, he was being prosecuted for lese majeste. The editors of Neues Leben dissociated themselves from Klink and their supporters. Meanwhile Klink had been handed over to the German police by the Dutch authorities in 1903 just after publishing the last copy of Freiheit on the 1st May 1903. In the meantime, Pawlowitsch had obtained a salaried position with the labour exchange of the metalworkers’ union in 1902 and shortly after left the editorial board of Neues Leben, gradually dissociating himself from the anarchist movement and joining the SPD in 1907. “But the unfortunate controversy created in the new movement by those odious facts continued to have consequences for a long time and prevented any fruitful activity” (Rocker). In 1903 Paul Frauböse (born 1869-?) and Lange pushed for the founding of the organisation Anarchistische Föderation Deutschlands (Anarchist Federation of Germany AFD). They tried to counter the sectarian character of the movement and move towards mass agitation and a mobilisation for the Social General Strike. 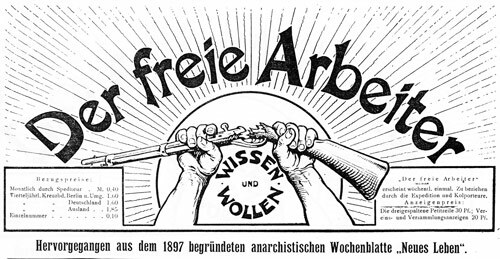 The first issue of Der Freie Arbeiter, which succeeded Neues Leben, spoke for the AFD and was edited in Berlin, appearing first in January 1904. Forty groups were involved in the Federation, with a total membership of between 400-500. “In January 1904 the Der Freie Arbeiter (The Free Worker) started being published in Berlin, its editors put themselves entirely in the field of the revolutionary movement of the masses, and it defended direct action and the general strike. A strong case for those tactics had already been made by Rudolf Lange and other comrades, which is why they published the Anarchist. But, at the time to place oneself in the mass revolutionary movement, the subject of organization came up once again and, in fact, Lange was one of the strongest supporters of large scale anarchist organization, and his staunch defence of this position frequently stirred up opposition among his German comrades. When the German Anarchist Federation’s Mannheim Conference (1907) established lines of conduct in that regard, it, as expected, caused several people to protest against it, in these complaints the autocratic absolute autonomy of the individual played a big role” (Rocker). However, Frauböse began to criticise Der Freie Arbeiter and in 1905 founded Der Revolutionär (The Revolutionary) which also spoke for the Federation with a circulation of 2000 copies. It was a failure and Frauböse left to join Landauer’s Sozialistische Bund in 1908. Der Freie Arbeiter thus won the argument with a circulation of about 5,000 copies at its peak in 1910. Lange continued to push for greater organisation within the AFD. He prepared a new constitution, addressing itself to a statute of membership, autonomy of groups and a management commission at the 6th congress of the AFD in Leipzig in 1909 which was accepted in 1910. Lange said that the anarchist movement “must shed its sectarian character” and transform itself into a “freely chosen but firmly binding association that is not opposed to anarchist principles … We are part of the proletarian movement and must take the organisational consequences”. This was followed up at the 9th Congress in 1912. Landauer who had set up the Sozialistischer Bund around the same time and hoped unsuccessfully to attract most anarchists into his grouping, strongly criticised this move. He argued against the class positions of the AFD, counterposing the idea of “community” to class. Extremely active in the AFD in Hamburg was the activist Paul Schreyer who began to build up an anarchist influence among the dockers there. But the First World War was to play havoc with all the anarchist and socialist groupings in Germany. On the outbreak of war Lange committed suicide in despair. His “death left a void that could not easily be filled” (Rocker), whilst Schreyer died after a harsh prison term in 1918. The AFD and the Freie Arbeiter were banned by the German state. The AFD activists were disoriented by the war. Only in April 1919 did an old member of the AFD, Rudolf Oestreich (3), begin to resurrect anarchist communist organisation, with the foundation of the Föderation Kommunistischer Anarchisten Deutschlands (Federation of Communist Anarchists of Germany-FKAD) as the successor to the AFD. The Freie Arbeiter was revived as the organ of the FKAD running until it was closed down by the Nazis in 1933. It reached a peak print run of 7,200 in 1923. However, in the aftermath of the war, many old AFD activists decided to join the FAUD (Freie Arbeiter Union Deutschlands) itself the successor of the FVdG. These included Oskar Kohl in Dresden, Arthur Holke in Leipzig, Richard Klose in Magdeburg, Heinrich Drowes in Elberfeld, Georg Hepp in Frankfurt, Frank Künstler in Stuttgart, August Kettenbach in Wiesbaden, Fritz Oerter in Fürth, Emil Scheurer in Heilbronn, Wilhelm Wehner in Schweinfurt, Max Metzner in Halle. In addition, Oestreich was an extremely sectarian and argumentative personality. He sued Rudolf Rocker and Helmut Rüdiger in 1928 in the bourgeois courts over the ownership of the contents of the London German anarchist library, as a result of which they received fines of 100 marks each and narrowly avoided a prison sentence. Oestreich also spread lies about Erich Mühsam, saying that he had supported the First World War, when the opposite had been the case. As a result, the FKAD at its height had no more than 700 members and 35 groups whereas the FAUD at its peak had a membership of 150,000. Other active members of the FKAD included the Jewish anarchist Berthold Cahn who perished in the concentration camps and Clara Ellrich-Siemß (1869-1946) who had passed through the USPD and KPD before joining the FKAD in 1921.Erich Mühsam had initially been a member too. The FKAD claimed to have “higher tasks” than just the economic struggle so there was a tense relationship between the FAUD and the FKAD (though there were cases of joint membership). The FKAD’s main activity was the production and distribution of propaganda, including leaflets and posters and the distribution of Freie Arbeiter. The average circulation of Freie Arbeiter was 4,600 which compared unfavourably with a circulation three times that amount before the war. In Berlin the Neukölln group left the FKAD and founded the Anarchistische Verein Neukölln. However, this only had a membership of 36 with Mühsam joining it after a prison term in 1924. Up until then he had worked closely with Oestreich and the FKAD but his work with the Rote Hilfe (Red Aid) prisoner support organisation controlled by the KPD ended with his expulsion from the FKAD on 15th October 1925. The toxic atmosphere generated by the trial of Rocker and Rüdiger worsened when Oestreich launched an attack on the FAUD at the FKAD conference in 1928. Here he called for active participation in all economic organisations rather than the specific syndicalist organisations. He was contradicted at the next FKAD conference by Cahn who called for cooperation between the FAUD and the FKAD. This was fiercely resisted by Oestreich. When the Organisational Platform of the Libertarian Communists written by Arshinov, Makhno, Mett et al appeared in 1926 Oestreich agreed with them that the international anarchist movement was in a poor way. However, he disagreed with the need for tactical and theoretical unity and the need for a programme. In the end the 1931 conference of the FKAD decided to change its name to the Anarchist Federation against the arguments of Oestreich. The Nazi rise to power in 1933 was to end any further developments. In this often sorry tale of vicious disputes and splits it would be worthwhile to remember the words of Rudolf Rocker reflecting on this situation. “The vast majority of old comrades had passed through the social-democratic stage and had assimilated an inheritance that was not easy to eradicate. The claim to infallibility and a strict discipline, which did not allow the birth of free thought, are a bad school for development of mutual tolerance and understanding… to this add another circumstance: the movement was unfortunately so weak that any divergence of opinion had to lead to serious internal conflicts. In a broad field of action, each one finds at the end a place for his activity. But in one limited movement, where men (sic) are forced to meet in very small circles, there is a much greater possibility of clashes and internal conflicts”. (1)Born in Affaltrach in 1875. Member of the Jungen opposition within the Social Democratic Party. Moved to an anarchist communist position in 1896 like many members of the Jungen. Published 6 issues of Freiheit from 1896. Later before 1910 lived in Böckingen and founded there in 1911 the “Association for social welfare Heilbronn”, the nucleus of today’s housing association GEWO. Wrote in May 1912 a play in 4 acts about Margarete Renner the revolutionary of the Peasants’ Wars. (2) Full name Karl Rudolf Heinrich Lange, born 18th March 1873 in Lübeck. A shop clerk. Spoke fluent Swedish, Danish, English, French, Spanish and Italian. Son of a miller and described as very tall and strong by Rocker who also complemented him as the most “remarkable brain” within the German anarchist movement, a good writer and “capable and effective speaker, who was unlikely to be dominated by an opponent”. Member of the Social Democrats, joined the Jungen and then under the influence of Landauer, moved to an anarchist position. Had a deep knowledge of Marxist literature. Oriented towards agitation within the working class. Escaped to London in 1896 to avoid a prison sentence. Often accompanied Rocker on his visits to the East End of London. Some Jewish anarchists taught him shoemaking and he persisted with this work for 5-6 weeks but was not good at the job. Unable to gain employment elsewhere, he returned to Germany to serve his sentence. Settled in Berlin after this, where he remained until his death. Later visited Leeds, where he met with Rocker, Billy MacQueen and Toni Petersen, a former editor of the anarchist paper Proletaren in Copenhagen who had jointly set up a system for smuggling German language anarchist literature, printed by Petersen in Leeds, into Germany. Attended International Anarchist Congress in Amsterdam in 1907. (3) Oestreich was born in 1873. A metalworker. Served 4 years for anti-militarist activities before WW1. After WW2 co-edited a reincarnation of the Freie Arbeiter with Willi Huppertz. Died in 1963. Mendes-Flohr, P., Mali, A. (eds) Gustav Landauer: Anarchist and Jew (2014).